Found in "The Big Five Motorcycle Boys At The Front" by Ralph Marlow. Published by A.L. Burt, 1915. Did you read the book and was it good? No, I haven't read this one. "It is doubtful whether a more entertaining lot of boys ever before appeared in a story than the 'Big Five,' who figure in the pages of this volume -- Red Bradley; 'Hanky Panky' Jucklin; Josh Whitcomb; Elmer Overton; and last, but far from least, 'Rooster' Boggs. 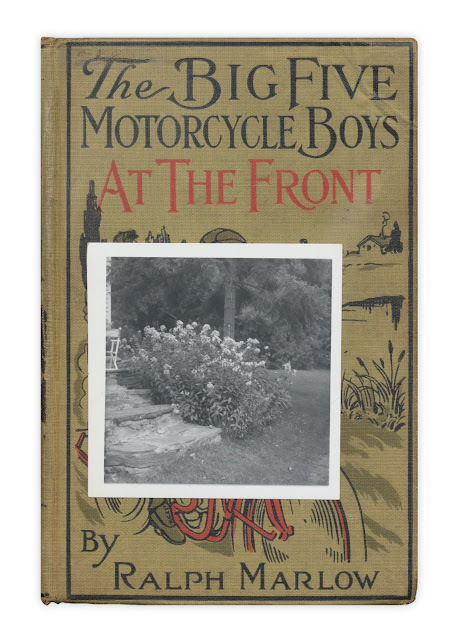 From cover to cover the reader will be thrilled and delighted with the accounts of how luckily they came by their motorcycles; and what splendid use they make of the machines in recovering the funds of the robbed Garland bank." -- 1914. A.L. Burt.